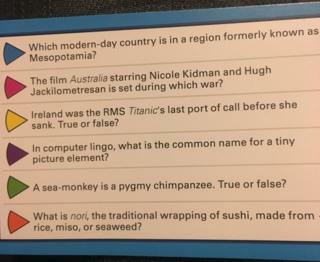 Image caption Spot the mistake: Hugh Jackman has been renamed 'Hugh Jackilometresan' in a Trivial Pursuit question spotted by Twitter user John E Lewis. It's a Christmas staple with many families. When the turkey's gone cold and the evening's drawn in, it's the Trivial Pursuit board which often comes out. And it was a "newish" Christmas gift of the popular board game from his nephew which prompted John Lewis, 47, to share a picture of the game on social media that has subsequently been shared thousands of times. Lewis - not the department store, not the US man who is frequently mistaken for a department store on Twitter, but a journalist and editor from London - was playing the Family Edition of the game on Tuesday when his daughter discovered an unusual error. Reading a question about 2008 film Australia, starring Nicole Kidman and Hugh Jackman, Lewis' daughter was baffled. A mysterious 'Hugh Jackilometresan' appeared to have supplanted Jackman as the film's leading man. "She showed us the card and we all found it hilarious," Lewis said. "As an editor, I also immediately guessed how it had happened." Image caption Lewis is not the first social media user to spot the error. @JackStooks and others noticed the problem back in 2015. Lewis believes that the error could have been caused by a "cavalier find-and-replace command" where 'km' had been substituted for 'kilometres' by the game's makers. Hasbro has been approached for comment. And he says that was not the only example he spotted. "There is another error I later found in the same pack," he said, "where 'kg' has been universally replaced to 'kilograms'. "So the question reads: 'What U2 song plays in the 'backilogramsound' of the famous Friends episode where Ross tries to get Rachel back after they were on a break?" Lewis shared his image on Facebook and Twitter, where his post has attracted thousands of retweets and likes. "I don't even use Twitter that much," he said. "But this Trivial Pursuit tweet has had something ridiculous like 8,000 likes and more than 5,000 retweets in the last 36 hours."